THE student of astrology should realize that every horoscope, instead of being a combination of mystical symbols, is in fact a map of actual vibratory currents which are operating at the time for which it is erected. These vibratory currents constitute the inner-plane weather. It has been conclusively demonstrated bBy many universities, which have carried out innumerable experiments in extrasensory perception and psychokinesis, that inner-plane energies do not conform to physical laws. The outer-plane weather not only influences life on earth, but also inanimate objects, as illustrated by mountain chains being worn down and carried into the ocean. However, when velocities exceed that of light there can be no atoms or molecules. Thus the inner-plane weather, which has velocities exceeding that of light, influences both animate and inanimate objects through nonphysical laws which may be discovered, not by theory, but by observing how things actually react to different types of inner-plane weather. Astrological currents constitute the inner-plane weather, the ten outstanding types being the vibratory currents radiated by the ten planets, each having its own characteristic influences. And to understand individual reaction to the inner-plane weather mapped by astrological positions it should be recognized that most of the actions of human life spring into existence, not as a result of premeditation, but due to habitual reaction to feeling, which in turn is powerfully influenced by the planetary energies which at any time are added to certain thought cells of the unconscious mind. Psychology teaches us that at least 99% of all men�s actions are promoted by the unconscious mind. The unconscious mind, as fully explained in the lessons in Course V, Esoteric Psychology, is an organization of thought elements into thought cells and thought structures. 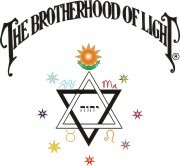 This organization persists in the same astral substance that carries the vibrations of planetary influence. And not only does a birth chart map the arrangement and volume of energy of different types possessed by these thought cells, and therefore the individual�s character, but the progressed aspects map the time when groups of these thought cells acquire sufficient additional planetary energy that they have enough psychokinetic power to attract events of a corresponding nature. As already indicated, man is not the only thing influenced by the stars. Each physical object has an astral counterpart that is constantly affected by vibrations of astral substance that reach it from celestial bodies. In turn, the astral counterpart profoundly affects the physical. And as thoughts are essentially organizations in astral substance they too respond to such astral vibratory rates. Currents of astral force not only bring changes to man�s physical body, but they stimulate the trend of his thinking, and impress their power upon everything by which he is surrounded. Every horoscope is a map of such astral currents showing four important factors: (1) The Tone, or Rate of Vibration, of each stream of planetary force. This depends upon its wavelength and frequency. (2) The Tone Quality of the current from each planet. While the aspects map the chief harmonies and discords, minor and quite distinctive harmonies and discords arise from the medium, or Sign the planet occupies. (3) The Power, or Volume of energy coming from each planet. While each aspect, through the joining of energies, adds to a planet�s Power, much also depends upon the Direction from which the energy reaches that point on earth for which the chart is erected. (4) The Aspects indicate the chief Harmonies and Discords. These depend upon the angles at which the streams of energy meet each other. Having such a chart of astral currents, and being aware of the particular thing receiving these vibrations, it is possible to estimate the reactions to their influence. Because these reactions constitute events, this makes accurate prediction of trends possible. 1. The First Requisite for judging any horoscope—Natal, Stellar Diagnosis, Mundane, Weather, or Horary—is to know the particular Tone, or rate of vibration, radiated by each of the planets, and what the observed effects are of these vibrations upon life. Just as colors, musical tones, etc., depend upon electromagnetic wavelengths or wavelengths of physical substance, so each planet radiates a given wavelength and frequency in astral substance which we call its Tone. The effect of each planetary Tone is given in Chapter 3 (Serial Lesson 47), Course II, Astrological Signatures. Of the 10 planets only 4 are harmonious or discordant due to their own nature. Venus is harmonious, adding harmony equal to � the power of each aspect it makes. Mars is discordant, adding discord equal to � the power of each aspect it makes. Jupiter, the major benefic, adds harmony � the power of each aspect it makes. And Saturn, the major malefic, adds discord � the power of each aspect it makes. The other 6 planets are neutral insofar as harmony or discord is concerned, their harmony or discord being determined only by their essential dignity and the aspects they form. 2. The Second Requisite for judging any horoscope is to know the Tone Quality of each Sign and Planet in the chart. 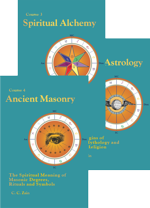 The Nature and Tone Quality of each of the 12 Signs is fully explained in Chapter 2 (Serial Lesson 46), Course II, Astrological Signatures. This Tone Quality of a sign influences each planet found in the sign in a somewhat different manner. This is due to the particular planetary tone and the characteristic resonance of the sign. The zodiacal signs act as sounding boards, or instruments, from which the planetary vibrations reach the earth. Each is a definite section of the astromagnetic field of force which surrounds the sun. Due to this definite position in a field of force, the tension of the astral substance through which the vibrations of a planet must travel is different in each sign, and varies to a less extent even in the different decanates of the same sign. This property of the astral substance of a sign may make it a harmonious sounding board for transmitting the vibrations of some of the planets, but a discordant sounding board for transmitting the vibrations of other planets. Furthermore, when one planet is in the home sign or exaltation sign of the other planet at the same time the other planet is in the home sign or exaltation sign of this planet, the resonance thus created tends to be the most harmonious of any due to the sign Positions of planets. Such sign relationship between planets is called MUTUAL RECEPTION. Observation indicates that the departments of life ruled by houses occupied by planets thus in mutual reception tend markedly to assist each other. Planets do not need to be in aspect with each other to be in MUTUAL RECEPTION. The power, harmony or discord of any birth-chart or progressed planet, aspect, sign or house can be precisely calculated. Explanation of how to make these calculations is given in Course XVI, Stellar Healing. But here only certain comparisons will be made. Power is measured in astrodynes, harmony in harmodynes, and discord is discordynes. Planets in MUTUAL RECEPTION gain � the harmony given neutral planets when in an angle and making the perfect trine. It has experimentally been determined that a planet not only sets up vibrations in the sign it occupies, but also in certain other signs. These special signs are so sympathetically tuned to the planet that they vibrate to it no matter where it is located. They are keyed to the tone of the planet, and respond to its vibrations, much as a musical instrument keyed to a particular tone will respond to that tone when struck on another instrument, even when the other instrument is at a distance. These signs that persistently transmit the vibrations of a given planet, whether or not the planet is in them, are said to be Ruled by that planet. When the planet is in one of these signs it Rules, it is said to be at HOME. The sign that a planet rules transmits easily the constructive characteristics of the planet when the planet is in it. A planet at HOME thus gains the harmony given neutral planets when in a succedent house and making the perfect semisextile. When a planet is in the sign opposite its home, which is called its DETRIMENT, it thus gains � the discord given neutral planets when in a succedent house and making the perfect semisquare. The vibratory quality of the signs ruled by a planet is markedly influenced by any modification in the vibration of the planet. If it sounds from some other sign that does not permit harmonious expression, this discord is also called out in the signs ruled by the planet. That is, the signs ruled by a planet respond to the vibrations that actually reach them, and these vibrations are given a harmonious or a discordant trend, not merely by the aspects of the planet, but also by the sign in which the planet is located. When a planet is not in the sign, but rules the sign, and the sign is on the cusp of a house, the sign through resonance gains � the planet�s power, harmony or discord. If the sign is not on the cusp of a house, but is an intercepted sign, it gains through resonance � the planet�s power, harmony or discord. The most refined influence exerted by a planet however, is not when it is at home, but when in another sign which not only permits it to express its energy fully, but which due to the peculiar quality of its astral substance, lends itself particularly to the expression of the finer and more intense vibrations of the planetary tone. This other sign, which only transmits the planet�s vibrations strongly when the planet is in it, yet which lends itself singularly to the highest expression of the planet�s qualities, is called the planet�s EXALTATION. A planet in its exaltation thus gains � the harmony given neutral planets when in a succedent house and making the perfect sextile. When a planet is in the sign opposite its exaltation, which is called its FALL, it thus gains the discord given a neutral planet in a cadent house and making the perfect semisquare. The ancients held that there is also a particular degree in the Sign of Exaltation in which the planet exerts a better influence than in any other degree of the zodiac. Modern observation tends to confirm this. When a planet is in this particular degree which is called its DEGREE OF EXALTATION, it gains � the harmony given neutral planets when in a succedent house and making the perfect trine. When a planet is in the degree opposite its degree of exaltation, which is called its DEGREE OF FALL, it thus gains the discord given neutral planets when in a succedent house and making the perfect semisquare. There is also another sign in which a planet gains a little harmony, but only half as much as when at home. This sign is called its HARMONY. A planet in the sign of its harmony thus gains � the harmony given neutral planets when in a succedent house and making the perfect semisextile. When a planet is in the sign opposite its harmony, which is called its INHARMONY, it thus gains � the discord given neutral planets when in succedent houses and making the perfect semisquare. By his general knowledge of the nature of each planet and each sign, the student becomes able approximately to determine the harmony or discord of a planet in any sign; for as a rule a planet is harmonious in a sign the nature of which is similar to its own, and discordant in a sign having dissimilar characteristics. But as this has been experimentally ascertained by others, it is well to memorize the signs in which each planet has its Home, Exaltation, Harmony, and also its Degree of Exaltation. From these the Detriment, Fall, Inharmony, and Degree of Fall can be ascertained by using the opposite factor in the zodiac. This harmony or discord of a planet due to being able to express its own true nature by occupying a sign or degree which forms a favorable or unfavorable sounding board for transmitting its vibrations is called the planet�s ESSENTIAL DIGNITY. The table gives the Essential Dignities of the planets, and should be well memorized. 3. The Third Requisite for judging any horoscope is to determine the Power, or Volume, or Quantity of force exerted by each planet in the chart. Each planet always vibrates to one particular tone, or Key; the Quality, or resonance being determined by the Sign it occupies; and the other harmony or discord depending largely upon the aspects it makes. Each aspect it makes increases its Power, which also is markedly influenced by the direction from which its stream of energy reaches the point on earth for which the chart is erected. The reason the astral energy flowing from a planet does not reach all points on the earth in equal volume is probably due to the amount and density, as well as the movement, of the earth�s astral substance it must penetrate. Relative to the Sun�s position, the astral substance of the earth has areas of different pressure, or density, even as there are regions of different density in the earth�s atmosphere caused by the sun. The trade winds, for instance, are an example of such sun-produced different atmospheric densities. It is as if the earth were an auditorium into which the vibrations of the planets must penetrate from the outside; and that at regular intervals there were open doors, at other intervals small windows, and at other places thick walls, through which the planetary tones must pass. The twelve sections, or areas of different astral densities about the earth, called Mundane Houses, have been explained fully in Chapter 3 (Serial Lesson 47), Course II, Astrological Signatures. While the type of harmony or discord called the Quality of the planetary energy depends upon the Sign it is in, and the other harmony or discord, aside from that derived from the essential nature of the planet, depends upon the type of Aspects it makes, the Power, quantity or amount of energy it exerts depends upon the Aspects it makes and the Houses of the horoscope it occupies. All the planets pass through all the houses of a horoscope in the interval of 24 hours; but they remain days, and some of them many years, in each zodiacal sign. This house position of a planet, because of its short duration, is technically spoken of as its accidental station. Thus the Volume, or lack of it, due to a planet�s position by House is called its ACCIDENTAL DIGNITY. This Volume of energy exerted by a planet in each of the 12 Mundane Houses has been determined experimentally. As a general rule—the rule being handed down from ancient times—any planet in an Angular House exerts a Very Powerful influence, any planet in a Succedent House exerts only Average influence by power, and any planet in a Cadent House exerts Very Feeble power. But experience proves there are exceptions to this rule. Nevertheless, it will be found that an Angular House is more powerful than the Succedent, and a Succedent than a Cadent, House of its own quadrant of the Heavens. The Power of a planet in any of the angles is greater than in any of the other houses, without exception; and the nearer a planet is to the Cusp of a house the more Power it exerts in that house. The most powerful houses for a planet are the 1st and 10th houses. The volume of energy received from a planet in either of these houses is about the same. Next in volume of energy is the 7th house; and the feeblest of the angles is the 4th house. A planet in an Angle may always be considered VERY POWERFUL. Next in Power are the 11th, 8th, 9th, and 12th, in the order named. A planet in the 8th or 12th has a less fortunate trend, as a rule, than if in the 9th or 11th, but we are here considering the Volume of Force, not its ability to attract fortunate events. A planet in the 11th, 8th, 9th or 12th house of the horoscope may always be considered MODERATELY POWERFUL. The 2nd house is somewhat more powerful than the 3rd, but planets in the 2nd and 3rd houses should always be considered FEEBLE. The 6th house is the feeblest position in the entire chart, the 5th house having little more volume. Planets in the 5th or 6th houses of a chart, aside from their aspects, are VERY FEEBLE. 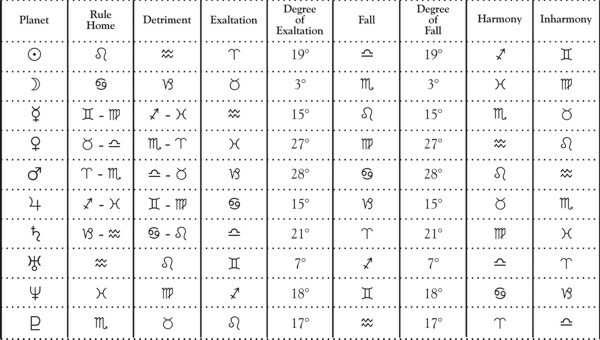 The table on page 2 gives the ACCIDENTAL DIGNITIES of planets when found in the various houses of a horoscope. 4. The Fourth Requisite for judging any horoscope is to determine to what extent each planet�s rays are harmonious or discordant, and in what particular way the harmony or discord manifests. The essential nature of the four of the 10 planets, and the essential dignity of each planet, contributes to this; but the chief factors are the aspects the planet makes. In Chapter 3 (Serial Lesson 41), Course I, Laws of Occultism, it is fully explained how the streams of astral force from the planets converging at definite angles set up vortices, or whirls, of astral substance, and thus—as does the outer-plane weather—affect life. These whirls are produced only when the streams of force converge approximately at certain angles. And the nature of the whirl produced by streams of planetary force meeting at one angle is different from the whirl produced by planetary streams meeting at other angles. These angles, from which planetary energies meeting are known to produce whirls of a definite character, are called ASPECTS. The aspects which have a proved effect are ten in number, and are mentioned in Chapter 3 (Serial Lesson 47), Course II, Astrological Signatures. It is found that rays of planetary force converging at half a right angle, a right angle (90�), a right angle and a half, and twice a right angle, produce whirls in astral substance that are decidedly destructive in nature, but that the momentum of the whirl is different in each of these aspects, and consequently the destructive forces operate differently. It is found that rays of planetary force meeting at a trine (120�), a half trine, and one-fourth of a trine, produce whirls in astral substance that are constructive in nature; but the modes of constructive activity differ with each aspect. As do all the mentioned aspects the other three—conjunction, inconjunct and parallel—add Power to the planetary force of the planets involved, but so far as harmony or discord is concerned they are neutral. Of themselves they are neither constructive nor destructive. It might seem, from a cursory examination of the subject, as planets move north and south of the ecliptic, or path of the sun, that in calculating aspects this celestial latitude should be considered and the angle of the aspect determined upon a spherical basis. So to determine the aspects would make necessary a trigonometrical calculation for all planets not having the same North or South Latitude. Experience proves, however, that the latitude of a planet—its distance from the ecliptic—need not be considered in calculating aspects. The ecliptic, or path of the sun, is the place of polarization in the field of force of our solar system; and planetary vibrations tend to travel parallel to the plane of the ecliptic rather than to cut across it diagonally. Therefore, the Zodiacal Degree or Degree of Declination which a planet occupies always indicates the direction in the heavens from which its vibrations reach a given spot, and all aspects, with the exception of the parallel, should be calculated from Zodiacal longitude, without regard to celestial latitude. The parallel disregards celestial latitude, but it is calculated from the declination, which is the distance from the celestial equator. This rule applies to Progressed Aspects as well as to aspects in the birth chart. I. A Conjunction is the aspect formed when two planets are approximately in the same degree of the zodiac. It is one of the three most potent aspects. The rays of astral energy radiated by the planets in conjunction travel almost identically the same path, each making it easier for the energy of the other fully to manifest. Thousands of charts analyzed by The Church of Light Research Department indicate there is no real basis for the teaching of some writers regarding either a planet "Combust" or a planet "Cazimi." Instead, the closer the planet is to a perfect conjunction with the Sun, the more its characteristics manifest. Jupiter or Venus always adds harmony to a planet in conjunction with it; and Saturn or Mars always adds discord to a planet in conjunction with it. But whether for good or ill, a conjunction always gives more power to both planets involved, and makes the things signified by each a prominent factor. A planet is combust when it is within 8� 30� of the Sun. According to some writers, when a planet is combust its influence is burnt up and destroyed, and it is considered to be a great affliction, the planet being weakened. They also say that a planet "Cazimi" is greatly strengthened. A planet is cazimi when it is within 17� of the Sun�s center. As the disc of the Sun occupies approximately half a degree, a planet cazimi sends its rays to the earth along lines quite identical with those of the Sun insofar as the zodiacal degree occupied is concerned, and the result would be some power. But we have never found a planet�s influence to be weakened by being in conjunction with the Sun. On the contrary, we have found that a planet in conjunction with the Sun invariably exerts a stronger influence in a birth chart than when not aspecting the Sun. When any planet is in conjunction with the Sun we have found it thus becomes a strong factor in molding the life and character of the person then born. As Mercury is never over 28� from the Sun, it is in combust in about one-fourth of all charts, and in a degree of combustion in about one-third of them. Venus is never more than 48� from the Sun, and as a consequence is combust in at least one-seventh of all charts, and in a degree of combustion in about one-third of them. We do not think any planet is weakened by being near the Sun, and point to the charts of Theodore Roosevelt (Serial Lesson 95, Course IX, Mental Alchemy), Thomas A. Edison (Serial Lesson 19, Course X-II, Progressing the Horoscope), Louis Pasteur (Serial Lesson 5, Course II, Astrological Signatures), Ewart Wm. Gladstone and Dr. Alfred Russel Wallace as examples picked at random who have Mercury combust in their birth charts. Innumerable other birth charts can be given of those with unusual brilliant minds who have Mercury combust. The fortune or misfortune signified by a conjunction, either in the birth chart or by progression usually is largely the result of the person�s own character and actions than that of the compelling force of environment beyond his control. The one word that best expresses the most pronounced influence of a Conjunction is PROMINENCE. II. A Semisextile is the aspect formed when two planets are approximately 30 zodiacal degrees apart. This is a feeble harmonious aspect. Its constructive whirl manifests as a mildly benefic cooperation between the things signified by the two planets. It does not bring favors without effort, nor does it signify unusual abilities. It indicates rather those opportunities that are not obvious, but which can be created through initiative, and slowly developed and expanded into something worthwhile. It signifies abilities and opportunities which are largely overlooked by less successful people, which are nevertheless present, but require a large amount of energy directed to them to bring them to fruition. 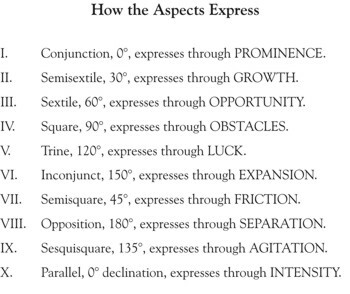 Whatever good is signified by the semisextile, either in the birth chart or by progression, requires careful cultivation to bring it out, and is a matter of gradual expansion. The one word that best expresses the most pronounced influence of a semisextile is GROWTH. III. A Sextile is the aspect formed when two planets are approximately 60 zodiacal degrees apart. This is a quite harmonious aspect. Its constructive energy manifests as adaptation to environment; there being such ability and opportunity as are signified by the two planets. It does not point to favors forced upon one, but both the ability to acquire the things signified and the opportunity to do so. 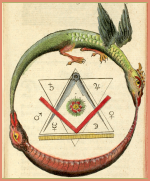 The sextile aspect does not place fortune, health, fame and love in one�s lap without effort; but it denotes a happy cooperation between the abilities of the individual and the opportunities that present themselves whereby if he applies himself he may attain favors signified by the planets. Whatever good is signified by the sextile, either in the birth chart or by progression, requires that opportunities be grasped as they present themselves; for if not quickly utilized they soon will pass and be beyond recall. The one word which best expresses the most pronounced influence of a Sextile is OPPORTUNITY. IV. A Square is the aspect formed when two planets are approximately 90 zodiacal degrees apart. This is a quite discordant aspect. The destructive energy of this astral maelstrom acts in a violent manner. Uncontrolled, it manifests in harsh, rash, explosive bursts of energy that tend to tear up and destroy all it contacts. It signifies positive lack of adaptation to environment, and consequent conflict. It brings acute crises, and temporary periods of struggle between the things signified by the two planets. Because of its abruptness, students sometimes conclude that the square is worse than the opposition. It certainly does act with more violence, and it frequently leaves nothing of value in its wake. The opposition, on the other hand, usually deprives of one thing while leaving another. Yet the square, according to my observation, has not the certainty, the power, nor the persistence of the opposition. The two aspects bring about events that are decidedly different, and bring them about in quite different ways. Whatever discord is signified by the square, either in the birth chart or by progression, results from incompatibility between the things signified by the two planets stirring up energy that periodically gets beyond control. A square brings acute conflict and violent antagonisms that cause radical changes. Yet it should not be forgotten that any form of energy, if properly controlled, can be used constructively. Practice is said to make for perfection, and certainly men learn to surmount difficulties by constantly being confronted with the necessity of surmounting them. Thus we find that the great men of the world invariably have squares in their birth charts. They have plenty of trials and conflicts, but they make each a stepping stone to attainment, learning the technique of overcoming obstructions, and turning the destructive energy into constructive lines. The one word that best expresses the most pronounced influence of a Square is OBSTACLE. V. A Trine is the aspect formed when two planets are approximately 120 degrees apart in the zodiac. This is the Best aspect. A trine signifies not only the abilities and opportunities bestowed by the two planets, but also such favors as come with very little effort. The good that comes through the trine comes easily and spontaneously. The abilities so signified grow naturally rather than being acquired with difficulty, and the opportunities are forced upon one without being asked for. Because the things denoted by the trine come so easily, they are often unappreciated. Trines signify good qualities in the character because where they are concerned there is no temptation. But too many trines never produce a strong, virile character, for there are too few obstacles to overcome, and too little struggle necessary. Character is developed through overcoming obstacles, not in permitting others to remove them so the path will be easy. Whatever good is signified by the trine, either in the birth chart or by progression, comes without commensurate effort. The one word that best expresses the most pronounced influence of a Trine is LUCK. VI. An Inconjunct is the aspect formed when two planets are approximately 150 degrees apart in the zodiac. It is a neutral aspect in so far as harmony or discord is concerned, tending to be harmonious only when Jupiter or Venus is involved, and tending to be discordant only when Saturn or Mars is involved. Its energy manifests in much the same manner as the conjunction and parallel, except that it has less force. Its strength is the same as the semisextile. The obstacles it brings when Saturn or Mars are involved are not too difficult to surmount, and the opportunities it brings when Jupiter or Venus are involved require initiative to make much of them. Either in the birth chart or by progression, the evil denoted by an inconjunct is easily converted into an advantage, and the good it signifies must be cultivated to prove of value. The aspect itself has the tendency to bring the things denoted by the two planets into some prominence, but to force them apart rather than together. The one word that best expresses the most pronounced influence of an Inconjunct is EXPANSION. VII. A Semisquare is the aspect formed when two planets are approximately 45 zodiacal degrees apart. This is a moderately discordant aspect. The destructive energy manifests as uncertainty and vacillation. It sets up oscillations between the things denoted by the two planets. In human life it causes anxiety, hesitation, worry, criticism and many recurring abrasions, rather than cataclysmic disruptions. The evil it signifies is usually due to the cumulative effect of the little discords in the environment. Either in the birth chart or by progression, it tends toward changes. The discord it attracts, however, may usually be turned to advantage by overlooking the small annoyances and using them as spurs to greater effort. The one word that best expresses the most pronounced influence of a Semisquare is FRICTION. VIII. An Opposition is the aspect formed when two planets are approximately 180 zodiacal degrees apart. Though acting in a less cataclysmic manner than the square, because of its persistence and power, this is usually considered the Worst aspect. The energies of the two planets, when so situated, meet each other head-on, and refusing to mingle, boil back along the lines from which they came. The result is that the qualities of both planets are brought into great prominence, even as they are in the conjunction. Consequently the greatest abilities that men possess are mapped by the conjunction and the opposition. The opposition confers the quality of each of the two planets in maximum degree. Because of this a majority of the great names of history have oppositions in their birth charts. Great men invariably have great opposition to overcome or they would not be considered great. The opposition aspect attracts this. There is a constant antagonism between the things represented by the two planets. This constant struggle for supremacy between the two planets does not act abruptly, nor in acute crises like the square aspect, but develops slowly and unrelentingly. It has an inexorable quality. The issue cannot be avoided. A choice must be made between one of the two opposing factors, and this choice involves the necessity of losing one of them. This disintegrative action proceeds slowly and inflexibly, and invariably tends to separate completely the things denoted by the planets. Either in the birth chart or by progression, the opposition signifies conditions more immediately forced upon one by environment and apparently beyond control, that makes the choice of one thing a necessity for renouncing another apparently desirable thing. It is a slow, inflexible rending asunder. The one word that best expresses the most pronounced influence of an Opposition is SEPARATION. IX. A Sesquisquare is the aspect formed when two planets are approximately 135 zodiacal degrees apart. This is a moderately discordant aspect, equal in strength to the semisquare. The energy of this discordant aspect has not the force of the square, or does it signify circumstances so important or antagonistic. Its action usually is to break up existing conditions rather suddenly, and thus pave the way for effort along somewhat different lines. It acts in quite sharp and disruptive intervals. It calls for more decision than the semisquare, but is not so persistent and long drawn out. Either in the birth chart or by progression, it signifies changes, either mental or physical, of a nature indicated by the planets; but these changes usually can be made an asset if accepted gracefully, for they open up new conditions. The word that best expresses the most pronounced influence of a Sesquisquare is AGITATION. X. The Parallel is the aspect formed when two planets occupy approximately the same degree of Declination, either both North or both South, or when one is North and the other is South of the celestial equator. This is the only aspect considered in the Hermetic System of Astrology which is not calculated by degrees in the zodiac. Even as the zodiac is divided by the equinoctial colure into positive and negative polarity, so in a somewhat similar manner the Equator divides our stellar auditorium, the astral substance immediately surrounding the earth, into positive and negative halves. When two planets are an equal distance from the equator, either north or south, they set up synchronous vibrations within the earth�s astral substance that have an effect somewhat like those produced by a conjunction in the zodiacal signs. That is, they tend to facilitate the manifestation of the full tones of both. Jupiter and Venus will make any planet with which it is parallel more fortunate, and Saturn or Mars will make any planet with which it is parallel more unfortunate. The parallel from any of the other six planets increases the power, commensurate with the conjunction, but does not appreciably affect its harmony or discord. A birth-chart or progressed parallel may express through the house of the chart ruled by either of the planets involved in the parallel. But usually at the time there are other aspects present, even though these other aspects may involve planets not ruling the house influenced. The influence of a parallel is not so precise nor so well defined as a conjunction. In its manifestation it is slower in development and more easily converted into energy of some other trend. Either in the birth chart or by progression, the parallel signifies qualities and conditions that develop slowly and that give gradual force to the things signified by the two planets. The one word that best expresses the most pronounced influence of a Parallel is INTENSITY. The particular kind of a whirl in astral substance produced by each of the 10 aspects is most perfect in its form, and manifests its own peculiar kind of energy in strongest degree, when the aspect is the exact number of degrees designated for each. A whirl of a given design in water, air, electromagnetic field, or astral substance, however, is not the product of currents meeting at one single angle, any more than the color red is the product of a single number of vibrations in the electromagnetic field per second. There is a limited range of vibrations all producing what we call red, though of different shades, until they finally merge into another color. The expression of a given aspect is strongest and clearest when the aspect is perfect, but the aspect will still manifest its peculiar energy, though less distinctly, as the number of degrees recedes from the perfect aspect, until its own distinctive kind of energy shades into that of the next aspect. With an occasional exception, such as when a powerful trine overrides and dominates a not too precise sesquisquare between adjacent aspects there is a space where the tendency to form one kind of whirl is neutralized by the tendency to produce another kind; just as in colors certain rates of vibration produce a shade that makes it difficult to say whether it is red or orange, being a blend of both. It has been determined through exhaustive research how many degrees removed from the perfect aspect that an aspect manifests its own kind of energy with sufficient distinctness to have an appreciable effect upon life. The number of degrees away from the perfect aspect that a planet manifests even a slightly characteristic quality of the aspect is called its orb of influence, or merely ORB. Not only do progressed aspects have a much more limited orb, but there is a marked difference in the way they operate at the margin of the orb. A great deal of research demonstrated that the orb of any progressed aspect is one degree from the perfect aspect, and that at the outer limit of this one degree orb the aspect has � the power it has when perfect; but that in a birth-chart aspect the influence tapers off gradually from its peak power, when perfect, to no power at the outer margin of its orb. One of the most important, and at the same time most difficult, considerations in every judgment from a horoscope is that of Orb of Influence. It may be well enough to say that as a general rule an orb of 5 degrees either way from a planet should be allowed; but students who use the full 5 degrees for the semisextiles in feeble houses, and limit the orb of influence to 5 degrees in oppositions from angular houses will find their judgment sadly at fault. They will never be able to render that fine discrimination that takes the science from the realm of broad generalities and gives to it the nicety and precision that are the marks of expert craftsmanship. The table on page 3 gives the Orb of Influence of each of the aspects when formed from succedent houses, from angular houses, and from cadent houses. It is the result of more than fifty years� experience judging horoscopes and the collaboration of the Research Department of The Church of Light. The student need not memorize this table, but should commit the following considerations to memory: Under average circumstances an orb of 2� is right for the semisextile and inconjunct between planets, and 3� when Sun or Moon is party to the aspect. For semisquare and sesquisquare, allow an orb of 4� for the planets, and 5� when Sun or Moon is party to the aspect. For the sextile, allow an orb of 6� between planets, and 7� when Sun or Moon is party to the aspect. For the square and trine, allow an orb of 8� for the planets, and 10� when the Sun or Moon is party to the aspect. For the conjunction and opposition, allow an orb of 10� between the planets, and 13� when the Sun or Moon is party to the aspect. For the parallel, an orb of 1� is correct. As the volume of a planet�s stream of energy reaching a given spot depends upon the house position, the student will find that he must allow a slightly larger orb when one or more of the aspecting planets occupies a powerful house, and an orb slightly less when both planets occupy feeble houses. The orb allowed should be that of the planet with most power due to being a luminary or occupying a powerful house. It should be memorized that for the conjunction, opposition, square or trine, when the planets, one or both are in angles, 2� should be added to the average orb given, and when neither of the planets is in an angle or succedent house, but both are in cadent houses, 2� should be subtracted from the given orb. With the sextile, semisextile, semisquare, sesquisquare and inconjunct, when one of the planets occupies an angle, 1� should be added to the average orb given, and when both are in cadent houses, 1� should be subtracted from the average orb. Calculating all the aspects that occur between the planets in any chart is a very simple matter when undertaken in a systematic manner. An example of this is given in Serial Lesson 88, "First Seven Steps in Judging Any Horoscope." Always start with the aspects of the Sun, as most important, than those of Mercury, Moon, etc. in the order given in Table II, in Serial Lesson 86 "How to Erect a Horoscope." The aspects must always be calculated the shortest distance between the planets, and never the contrary direction the planets usually travel in the zodiac. 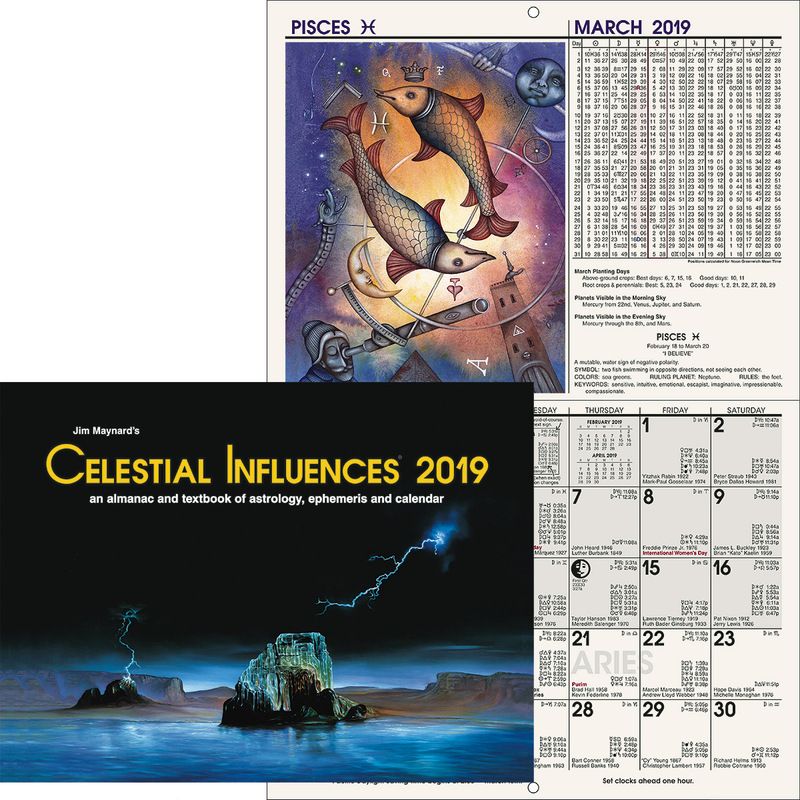 Always calculate from the planet that will enable you to count ahead in the natural order of the zodiacal signs, and always count the intercepted signs, as it is the number of signs apart and not the number of houses that make an aspect. If they are in adjacent signs they are semisextile, if two signs apart they are sextile, if three signs apart they are square, if four signs apart they are trine, if five signs apart they are inconjunct. Movable signs are always in square or opposition to each other, and taken collectively are known as the Movable Cross. Fixed signs are always in square or opposition to each other, and taken collectively are known as the Fixed Cross. Mutable signs are always in square or opposition to each other, and taken collectively are known as the Mutable Cross. When two planets are in approximately the same degree of any sign of one cross they are conjunction, opposition, or square. When two planets thus are in opposition and a third planet is square to both it is called a T-square. These things can be seen at a glance. Such a combination maps much energy, which if not diverted attracts misfortune. When two planets in opposition are both square to two other planets in opposition, thus making a complete cross, it is called a Grand Square. This is the most malefic combination that can occur in a chart. The signs of any one element are always in trine, and when two planets occupy approximately the same degree of different signs of the same element, or triplicity, they are always in trine. When both of the two planets which make a trine to each other are also trine to a third planet, so that approximately an equilateral triangle is formed, it is called a Grand Trine. This is the most benefic combination that can occur in a chart. Conjunctions always occur when planets are adjacent, and parallels when they occupy approximately the same degree of declination. A glance will reveal any of the above aspects and combinations. These are the semisquare and the sesquisquare. The degree occupied by a planet forming either of these aspects must always be approximately half a sign more than that occupied by the planet counted from. Therefore add 15� to the place of the first planet and notice if any other planet occupies approximately this degree in any other sign, not overlooking the fact that a planet in the last degree of one sign may be approximately in the same degree as a planet in the first degree of another sign. When a planet is found in such a place, notice if it is in a sign that is either a sign and a half, or four signs and a half, distant. If the former, it is a semisquare. If the latter, it is a sesquisquare. But if it is two signs and a half, three signs and a half, or five signs and a half, distant, it is in a position of little consequence and should be neglected.